During the late 1980’s there was a slew of rock n’ roll themed horror movies ranging from the sublime, “Black Roses” (1988) to the infamous, “Rock N’ Roll Nightmare” (1987). Rock and the excesses of 80’s rock specifically feel like a natural match for supernatural horror, a lot of this owing to the ‘Satanic Panic’ of the 80’s and the vilification of heavy metal in particular. Later, you would see something similar with gangsta rap in films like, “Tales from the Hood” (1995) and “Leprechaun in the Hood” (2000), but it always felt a bit strange since gangsta rap at least made pretentions of grounding itself in reality, so pairing it up with a killer Leprechaun feels a bit disingenuous (grunge made the same appeal to reality, perhaps this is why it also never paired with supernatural horror very successfully.) Sadly, all of this sociological and cultural observation in no way helps “Hard Rock Nightmare” exist as anything less than a huge goofy mess. After a flashback involving a kid driving a stake through the heart of the meanest grandpa in the world, we meet The Bad Boys, a mostly not terrible rock band that are fed up with getting harassed by the cops for practicing in their garage. They head out to family cabin of the lead singer Charlie (Greg Joujon-Roche). Charlie keeps having nightmares along the way and as the band and their girlfriends finally settle in the cabin to rehearse they start getting picked off by a werewolf. The biggest flaw about “Hard Rock Nightmare” is that it is too subdued for its own good. The film is paced so slowly that it becomes a slog to get through the first forty-five minutes. The movie spends far too much time fumbling around for tone and never really finding one at all. It’s never scary, gross, funny or lurid. It just occupies the middle ground of those things for most of its run. The Bad Boys never come across as very bad, more like a younger, angrier Huey Lewis and the News or maybe some kind of 1980’s proto-Nickleback. There are some things to recommend. 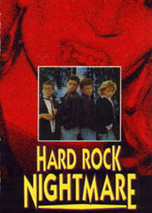 “Hard Rock Nightmare” quite often offers up some clever digs at movie conventions, including a hunky character who can’t satisfy the ladies in bed, a small joke about horror movie scores and a satisfyingly out of left field climax. There isn’t much gore but what little does exist is used effectively. There is also an excessively long dream sequence involving all the characters wearing each other’s underwear that is as pointless as it is amusing. If you go in expecting the lunatic heights of “Rock and Roll Nightmare” or “Black Roses”, or even “Trick or Treat” you’ll be disappointed. This film is much lower key. If you're super-humanly patient there's some fun to be had with this movie, everyone else might just want to fast forward to the last half-hour.